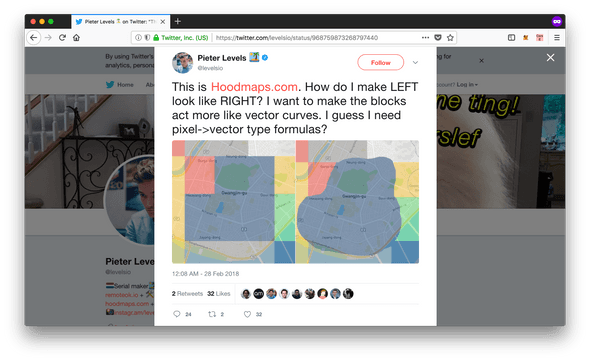 Today I saw a tweet from @levelsio where he asked how to draw areas on his HoodMaps project as vector curves instead of blocks. Here is my version. I propose to use Voronoi algorithm from D3js. D3js has a function voronoi that takes list of points (which will be centers of polygons) and then builds Voronoi diagram by them. My idea is to feed it a list of centers of those square blocks and it will draw polygons, then you can smooth or blur the polygons. Whatever will work better, or even both. As I said it’s possible to apply smoothing or blurring on top of it.